Lama Zopa Rinpoche meeting with His Holiness the Dalai Lama in Dharamsala, India, April 2015, with Ven. Roger Kunsang and Ven. Tendar. Photo courtesy of the Office of His Holiness the Dalai Lama. LRZTP 7 Starts in October! 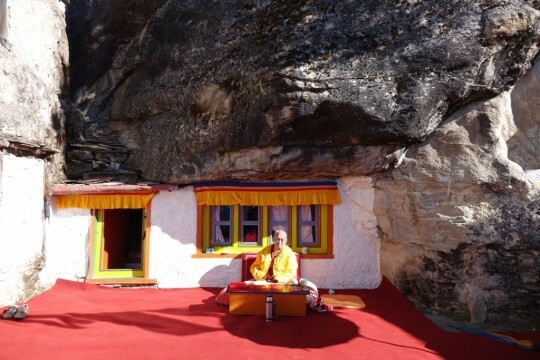 Lama Zopa Rinpoche in front of his cave in Lawudo, Nepal, April 2015. 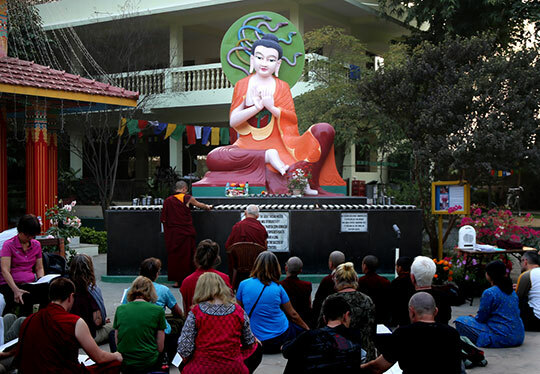 While staying at Root Institute in Bodhgaya, India, Lama Zopa Rinpoche explained a verse from Lama Chöpa that he had written out to be put in front of the large Nagarjuna statue at the center. Watch the video! Lama Zopa Rinpoche in front of the Nagarjuna statue at Root Institute, Bodhgaya, India, February 2015. Lama Zopa Rinpoche dictated this letter to the students of Maitreya School, Root Institute’s free school benefiting local impoverished children in Bodhgaya, India. Rinpoche wrote the letter after the school master explained that the main problem the children faced was parents drinking and fighting. Rinpoche asked that this letter be translated into Hindi, framed, put on the wall, and read and explained often to the students. 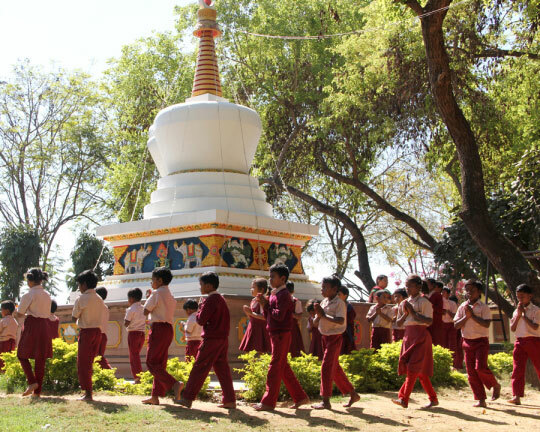 Students circumambulating the stupa at Maitreya School, Root Institute, Bodhgaya, India, March 2015. 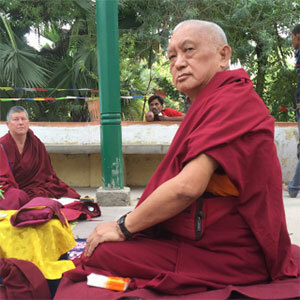 Lama Zopa Rinpoche teaching at Sujata, India, March 2015. Find more details about these events, including links to hosting centers and program titles. Subscribe to our FPMT news blog to get updates as soon as they are announced. Lama Zopa Rinpoche teaching in his cave at Lawudo, Nepal, April 2015. Rinpoche talked about the previous Lawudo Lama. With the growth of digital media and FPMT’s online presence flourishing, we decided it was time to reimagine Mandala magazine. As any long-time student of FPMT can tell you, Mandala has taken different forms over the three decades that it has been published. In June 2015, we unveil the newest, and we hope a very timeless and beautiful, version of Mandala! The redesigned Mandala magazine will be published twice a year and will offer the highest quality teachings, stories, interviews and photos to instruct and inspire FPMT students. We are increasing the number of pages and moving our news stories online in order to create an enduring publication that students will want keep and read over again. As part of our transition, we are forgoing the April-June 2015 issue. Our next print issue will be July-December 2015, which will come out in June 2015. Mandala’s expanded online publishing includes a new feature story every month. In this month’s feature, learn more about what goes inside an FPMT prayer wheel: the story of how student Tai Vautier helped combine microfilm with an ancient spiritual technology. Lama Zopa Rinpoche sitting on the top of his cave in Lawudo, Nepal, April 2015, taking great interest in the snow-covered mountains and everything going on in the valley below. Video of Lama Zopa Rinpoche Chanting Lama Chöpa Tunes: three new videos of Rinpoche chanting Lama Chöpa in three ways: fast-paced, medium-paced, and slow-paced. These videos provide an incredibly precious resource for FPMT students as learning these tunes will help ensure that the lineage of this practice is preserved. Découverte du bouddhisme en français: Le Service de traduction francophone de la FPMT est heureux de vous proposer d’étudier en ligne les modules d e​ Découverte du bouddhisme sur la base d’une donation libre. Un ​nouveau module vient d’être créé : n° 6 “Tout sur le karma”. Apprenez ce qu’est le karma et comment fonctionne la loi de cause à effet. Découvrez des solutions pour vivre votre vie de la façon la plus positive possible! eBooks Available: Several FPMT Education Services materials, including sutras, are available as eBooks in .mobi and .epub format. The .mobi file format is usable on Kindle devices and the .epub format is usable on most other e-reader devices. 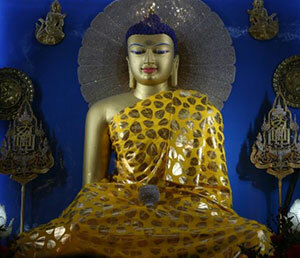 The Puja Fund offers the best quality robes to the Buddha statue in the Mahabodhi Temple, Bodhgaya, India every month. Every month the Puja Fund sponsors a new set of best quality robes to be offered to the precious Buddha statue inside the Mahabodhi Stupa in Bodhgaya, India. Please read more and enjoy the video filmed during the robes offering in March 2015. Lama Zopa Rinpoche and Ven. Roger Kunsang sharing some information with His Holiness the Dalai Lama in Dharamsala, India, April 2015. This new guideline gives the key points for good governance, generic for all boards, executive committees and trusts. “Good Governance” joins the other guidelines designed to help boards and management committees in the FPMT Affiliates Area. Additionally, your national or regional coordinator will be adding locally-specific information to this generic guideline. “We are happy to announce the opening of the 7th Lotsawa Rinchen Zangpo Translator Program, the FPMT four-year interpreter training course. The course will take place in Dharmsala, India for the first two years followed by a further two years of apprenticeship in an FPMT center. We will study colloquial and classical Tibetan, interpreting skills and Buddhist terminology in Tibetan for a variety of topics: lam-rim, lo-jong, tenets, debate etc. Institut Vajra Yogini, France started a fourth round of 108 nyung näs in November 2014, and halfway through, report that almost 600 nyung näs have been accumulated by more than 80 different people! Five people still intend to do the full 108 nyung näs. To make it possible for people to commit for the whole seven months of this intense practice, Lama Zopa Rinpoche is personally sponsoring each year up to 10 people willing to do 100 nyung näs through the Lama Zopa Rinpoche Bodhichitta Fund. Institut Vajra Yogini started this annual retreat with the wish to help fulfill one of Rinpoche’s Vast Visions: that some Western practitioners might successfully complete 1,000 nyung näs. A fifth round will probably start from mid-November 2015 to end of June 2016. Please contact Institut Vajra Yogini if you are interested in participating in any way. NEW: Tara’s Children Project and Maitreya School, projects of Root Institute, India, are looking for short- and long-term volunteers to teach English; Kadampa Center, USA has an opening for a full-time center manager; Milarepa Center, USA is looking for a full-time facilities and land manager. We welcome the first national coordinator for India – Dee Shekhar! Closed study group: Land for Nagarjuna’s Sutra and Tantra Study Group, USA – we rejoice in their efforts to serve sentient beings.